“Even the very hairs of your head are all numbered.” Luke 12:7. 1. The doctrine of divine providence has been received by wise men in all ages. It was believed by many of the eminent Heathens, not only philosophers, but orators and poets. Innumerable are the testimonies concerning it which are scattered up and down in their writings; agreeable to that well-knowing saying in Cicero, Deorum moderamine cuncta geri: “That all things, all events in this world, are under the management of God.” We might bring a cloud of witnesses to confirm this, were any so hardy as to deny it. Plainly meaning, that he never deviates from those general laws in favor of any particular person. This is a common supposition; but which is altogether inconsistent with the whole tenor of Scripture. For if God never deviates from these general laws, then there never was a miracle in the world; seeing every miracle is a deviation from the general laws of nature. Did the Almighty confine himself to these general laws, when he divided the Red Sea, when he commanded the waters to stand on a heap, and make a way for his redeemed to pass over? Did he act by general laws, when he caused the sun to stand still for the space of a whole day? No; nor in any of the miracles which are recorded either in the Old or New Testament. O blameless Bethel! to relieve thy breast! We answer, If it please God to continue the life of any of his servants, he will suspend that or any other law of nature: The stone shall not fall; the fire shall not burn; the foods shall not flow; or, he will give his angels charge, and in their hands shall they bear him up, through and above all dangers! 22. Admitting then, that, in the common course of nature, God does act by general laws, he has never precluded himself from making exceptions to them, whensoever he pleases; either by suspending that law in favor of those that love him, or by employing his mighty angels: By either of which means he can deliver out of all danger them that trust in him. 23. But I have not done with this same general providence yet. By the grace of God, I will sift it to the bottom: And I hope to show it is such stark-staring nonsense, as every man of sense ought to be utterly ashamed of. You say, “You allow a general providence, but deny a particular one.” And what is a general, of whatever kind it be, that includes no particulars? Is not every general necessarily made up of its several particulars? Can you instance in any general that is not? Tell me any genus, if you can, that contains no species. What is it that constitutes a genus, but so many species added together? What, I pray, is a whole that contains no parts? Mere nonsense and contradiction! Every whole must, in the nature of things, be made up of its several parts; insomuch that if there be no parts, there can be no whole. 24. As this is a point of the utmost importance, we may consider it a little farther. What do you mean by a general providence, contradistinguished from a particle? Do you mean a providence which superintends only the larger parts of the universe? Suppose the sun, moon, and stars. Does it not regard the earth too? You allow it does. But does it not likewise regard the inhabitants of it? Else what doth the earth, an inanimate lump of matter, signify? Is not one spirit, one heir of immortality, of more value than all the earth yea, though you add to it the sun, moon, and stars nay, and the whole inanimate creation? Might we not say, “These shall perish; but” this “remaineth: These all shall wax old as doth a garment;” but this (it may be said in a lower sense, even of the creature) is “the same, and his “years shall not fail”? 26. Do you mean (for we would fain find out your meaning, if you have any meaning at all) that the providence of God does indeed extend to all parts of the earth, with regard to great and singular events, such as the rise and fall of empires; but that the little concerns of this or that man are beneath the notice of the Almighty? Then you do not consider that great and little are merely relative terms, which have place only with respect to men. With regard to the Most High, man and all the concerns of men are nothing, less than nothing, before Him. And nothing is small in his sight that in any degree affects the welfare of any that fear God and work righteousness. What becomes, then, of your general providence, exclusive of a particle? Let it be for ever rejected by all rational men, as absurd, self-contradictory nonsense. We may then sum up the whole scriptural doctrine of providence in that fine saying of St. Austin, *Ita praesidet singulis sicut universis, et universis sicut singulis! *: that he presides over every individual as over the universe, and the universe as over every individual. Universal Cause Acts not by partial, but by general laws. At random on the air-suspended ball. * Note that Wesley has unconsciously imbibed the modern distinction of “supernatural” and “natural”, giving a legislative character to “laws” which are, in fact, merely descriptive of God’s common government. If only all the ECs who call their position “Wesleyan” would spend more time actually reading Wesley. I thought you’d like this one, Eddie! 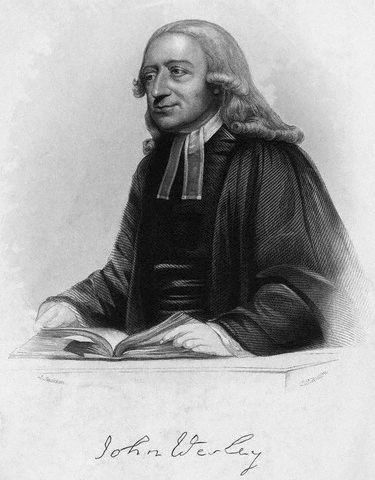 For readers not in the loop about the “Wesleyan Connexion” I need to point out that I’m not using Wesley as an argument from authority to endorse a high view of providence, but to refute those who, in the name of “the Wesleyan tradition”, have espoused “open process theology” in matters evolutionary. I meant to add that as far as I can see, every mainstream Christian tradition before Deism believed that God was fully involved with the world providentially. The only controversy was the extent to which providence might be involved in human choices (thereby presenting a problem to human will and accountability), and especially sin (thereby presenting a problem to God’s righteousness). Even so the majority of, at least, the Western tradition sought ways to reconcile God’s providence with freedom and the existence of evil, not to deny it.